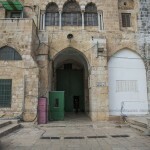 The third gate from the gates of Al-Aqsa in the northern fence, it is the gate of the honor of the prophets or Alatm’s gate, it is located in the west of Hutta’s gate. It has been called several names, the most famous was Alatms’ gate, and this label was launched after the construction of Qantara advancing the door to the north, causing gross darkness in broad daylight. This gate is also well known as the gate of the honor of the prophets and the gate of King Faisal. Naming King Faisal door is a modern naming ratio of King Faisal II of Iraq, it came when he visited the Al-Aqsa in 1943, and Supreme Islamic Council has invited him to commemorate his contribution to the building of Al Aqsa Mosque. 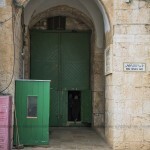 This gate is also known as Almazemih, ratio to Almazemih School, and it is known as Aldoadareih, a Proportion to Khanqah Aldoadareih (formerly Trochlearis School and Alwyn special education currently) next to it. The origin of this gate was Tri-lanes, nothing is left of it today expect the Western Section III because the middle and the eastern section had been closed and used when Khanqah Aldoadareih was established(695 AH / 1295 AD). It is likely that this triangular section back to the era of the Umayyad.